Weeping cherry trees are compact, gorgeous ornamental trees that produce beautiful spring flowers. Pink Snow Showers cherry is just one of these trees and a great choice if you want pink blooms, vigorous growth, and a perfect weeping form. 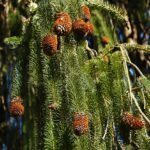 Here’s what you need to know to grow and care for this tree. A weeping cherry tree is a small ornamental tree with a weeping, or umbrella form. The branches hang down dramatically, creating an elegant form much prized in landscaping. Weeping Pink Snow Showers (Prunus x ‘Pisnshzam’ syn. Prunus ‘Pink Snow Showers’) is just one variety of weeping cherry, but it is a show stopper. This variety will grow to about 25 feet (8 meters) tall and 20 feet (6 meters) in spread, and produces an abundance of soft pink flowers in early spring. Once the flowers are finished, the tree will grow dark green leaves that turn golden in the fall. Both the flowers and the leaves contrast nicely with the dark red bark. Growing weeping Pink Show Showers cherry is well worth the minimal effort needed to care for it. With the right conditions, you will get a spring-blooming ornamental tree that will last at least 50 years. This weeping cherry variety is hardy through zone 5, so it is suitable for a range of climates. It is also well suited to urban environments because of its size and its tolerance of pollution. It prefers full sun and soil that is moist and well drained. 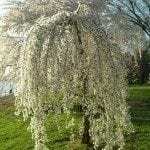 Your weeping cherry will tolerate poorer soil but may not grow as well. Your Pink Snow Showers cherry will need regular water, especially during hot and dry conditions. Regular watering is especially important in the first year to establish the roots. By the second year, you should be able to cut back. Light pruning in late winter or early spring before the blooms appear or after they are finished, will help maintain your tree’s health and the weeping form. This tree is particularly prone to developing water sprouts and suckers. These are small sticks that grow upright and ruin the weeping effect, so they should be removed as they appear. Watch out for pests and signs of disease and take steps to combat them early. Weeping cherry trees are prone to Japanese beetle and trunk borer infestations, as well as trunk canker disease and frost cracking in the trunk. Growing and caring for a Pink Snow Showers tree is a worthy effort to get the beautiful landscape element. This tree looks gorgeous nearly anywhere you put it, but it is particularly suited to water elements because of its weeping shape.